These Australian parakeets are commonly referred to as "grass parrots," "grass parakeets," or "grasskeets." The expected lifespan of these small parrot is 10 years or longer. The Bourke's parrot has recently been removed from the Neophema genus and placed in a genus of its own. Sometimes the broad-tailed parrots are considered a subfamily. In this case, Neophema and Bourke's parrot are united in the tribe Neophemini. mtDNA sequence data (Miyaki et al. 1998) suggests that the former may be correct, but the latter almost certainly isn't. It appears more likely that the group would need to include more closely related forms, such as the budgerigar and the ground-parrots (Pezoporus). 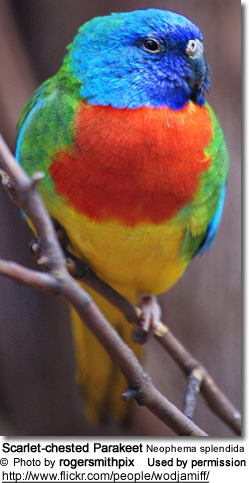 I have bred and kept as aviary birds several species (Bourke's, Elegants, Scarlet-chested/Splendid Parakeets and Turquoisines) and they have grown to be my very favorite aviary birds. They are beautiful, quiet, fascinating to watch. They are very family-oriented and curious, and can become quite trusting with the human care takers. I found them to be absolutely fantastic aviary birds. Although some people treasure these little parakeets as pets as well. They do best in planted aviaries. You have got to make sure they have plenty of room to fly, are protected from rats, mice, snakes, and other critter which might get to them or their eggs. You also have to provide them with adequate shelter and protection from wind, rain and cold weather. They are not as hardy as most of the other parrot species and do require a committed owner. They will accept just about any nest box that you may provide. Parakeet-sized boxes placed high up in the aviary are usually favorites. They will also accept cockatiel / lovebird-sized nest boxes. It's best to provide more nesting boxes than they are pairs -- to allow them to choose their favorite box and to reduce any fighting over favorites.